And those are just the ones which begin with "F"! FLORIDA'S GOVERNMENT IN TALLAHASSEE IS OUT OF CONTROL - IT IS NO LONGER "FOR THE PEOPLE" - IT IS WHAT THE LEGISLATOR'S WANT AND THE WANTS, NEEDS AND OBJECTIONS OF THE PEOPLE ARE IGNORED. THIS IS ALSO TRUE FOR MOST LOCAL GOVERNMENTS IN THE STATE! Florida led the U.S. in federal public corruption convictions from 2000 - 2010, according to U.S. Department of Justice data. Corruption was a top ten factor Forbes magazine pointed to in 2012 when it named three Florida cities to its list of America’s Most Miserable Cities: #1 Miami, #4 West Palm Beach and #7 Ft Lauderdale. 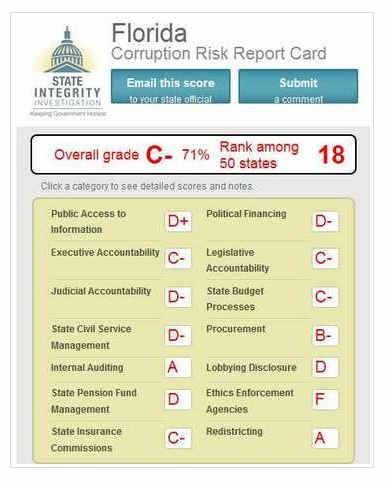 Florida also received a failing grade for ethics enforcement agencies on the Florida Corruption Risk Report Card released in 2012 by State Integrity Investigation. Florida faces a corruption crisis that threatens the state’s reputation, its economy and its ability to attract new jobs and capital. While implementing the ethics reform solutions presented in this report may not decrease the number of corruption convictions in Florida, it would certainly help the state move towards an A grade on the Corruption Risk Report Card and begin to improve the state’s reputation at a time when there is significant competition for jobs. 1. Self-initiate investigations: As the state ethics law enforcement agency, the Florida Commission on Ethics should be granted the authority to begin its own investigations. 2. Launch a report corruption hotline: Report corruption hotline to be managed either by the Florida Attorney General or the Florida Commission on Ethics. 3. Expand the ethics code to follow the money: Appropriate aspects of Florida’s state ethics code should apply to all who touch public money, including vendors. 4. Require top officials to disclose major transactions: Require all cabinet officials, state legislators, state agency heads and local elected officials to disclose details of all major financial transactions over $1,000 within the previous year, including stock trades, property transactions and changes in business ownership. 5. Create an online filing system: Financial disclosure forms should be filed electronically and made publicly available online in a searchable, updatable and downloadable format. Emails Do Show FL Legislators Spoke with Republican Leaders About the Redistricting Plan 2013; Documents released this week appear to show that Florida legislative leaders worked with state Republican officials to manipulate redistricting efforts, in apparent defiance of a constitutional amendment that banned such coordination. In 2010, voters in Florida approved changes to the state Constitution that prohibit legislators, who control the redistricting process in the state, from drawing lines to favor a particular party or incumbent. Redistricting is done every 10 years to redraw congressional and legislative districts to guarantee equal representation in light of new U.S. Census data. In early 2004, Governor Jeb Bush endorsed an effort to repeal the 2000 amendment that mandated the construction of the High Speed Rail System. On October 27, 2004, the authority voted to prefer the consortium of Fluor Corp. and Bombardier Transportation to build and operate the system, using Bombardier's Jet Train technology. However a month later in November, 2004, Florida voters voted to repeal the 2000 amendment, removing the constitutional mandate for the system. Although the amendment was repealed, no action was taken by the state legislature in regard to the Florida High Speed Rail Authority Act. (FL Constitution, Article X (hidden under miscellaneous) Section 19) 1Note.—This section was repealed effective January 4, 2005, by Ammendment proposed by Initiative Petition filed with the Secretary of State February 18, 2004; adopted 2004. See s. 5(e), Art. XI, State Constitution, for constitutional effective date. With the law still in effect, Florida's HSRA has continued to meet, and completed the environmental impact statement for the Tampa-Orlando segment in 2005. With the constitutional mandate gone, however, funding for the project came to a halt and very little action was taken over the next several years. So the Florida legislature of which was held in majority by the Republican Party in 2004 - 2005, CHOSE to ignore a legal vote on an amendment and proceeded to do as they darn well pleased.